As far as preliminary AMD graphics drivers go, the INF files are always interesting reads. Yes, these INF files are interesting because they provide some tidbits of information on the products that are supported with the driver. So a new preliminary driver was made available to the intertubes just a few days ago, and sure enough there are some interesting pieces of information about upcoming products. AMD’s new preliminary driver has a driver version of 13.150.0.0, and a compilation date of May 23. A few code names popped up that caught my eye. 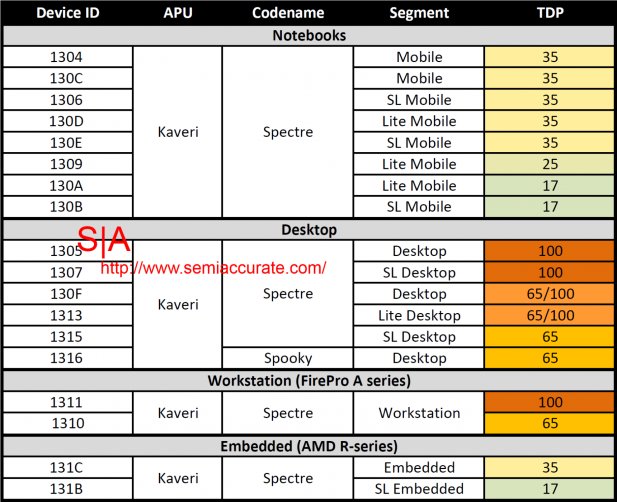 The first one is “Mullins“, judging from the looks, it’s actually a codename for future APUs, with a total of 16 variants, all targeting at the mobile market. [Author’s note: Successors of “Kabini” and “Temash” would launch in Q2 2014 given 1-year cadence. In addition, the driver INF files, “Kabini” and “Temash” are all listed as the former, so there’s a chance that the tablet variants are also included. Additionally, Mullins is the name of a river in Belize that’s close to the Temesh river.] With the code names added into the driver INF files, and drivers initial support for the chips, this is a rather clear indication that AMD has the first silicon back in the labs, or could be even closer to a final tape-out. Following the new mobile APUs is the most anticipated “Kaveri” APU, the first HSA-enabled APU from AMD. There are two GPU code names, “Spectre” and “Spooky“, the differences between the two graphics engines are not yet known, but all should based-off the GCN architecture. The code names of the graphics engines are based off the Lockheed AC-130H “Spectre” and Lockheed AC-130U “Spooky” ground-attack aircraft. The “Kaveri” family of APUs has a total of 18 variants for the graphics engines with different numbers of compute units and frequencies. There will be two variants for workstation market, to replace the current Trinity-based FirePro A300/A320 series workstation APUs with the possible addition of ECC memory support (as supported by both the “Steamroller” CPU cores and GCN-based graphics engine), and there will be another two variants for embedded markets to replace the current R-series embedded APUs. The power envelopes for “Kaveri” parts are the same as the current generation: 17W/25W/35W for mobile and embedded applications, and 65/100W for desktops and workstations. While there will still be a BGA offerings for the mobile variants, the relationship between the Lite and SL notations has yet to be revealed. Although judging by the TDP numbers (from largest to lowest) in general, it would seem that the sequence would be Normal → Lite → SL. Moving onto the discrete GPU side, we saw some new Islands. There is a new “Vesuvius“, along the already widespread “Hawaii“, joining the “Volcanic Islands” family. And “Tonga”, a “Sea Island” in New Zealand. There are also two “Not Used” entries in the same range as the “Vesuvius” GPU. In addition to the above APU and the Islands offerings, there are also some interesting parts for the “Solar” family. So the “Solar” family has “Sun“, “Venus“, “Saturn“, and “Neptune” variants. The “Neptune” variant is new, so as two “Venus PRO MCM” variants, MCM in chip packaging terms means multi-chip module, or it could mean the graphics memory is sitting directly on the substrate, like the Radeon E6760 embedded GPUs. 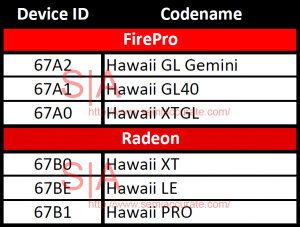 The driver INF file listed a few more “Bonaire” variants besides the launched Radeon HD 7790, and “Saturn” variants. These GPUs all based-off the same ASIC as the GPUs with their preliminary OpenCL posted on the InterTubes three months ago. 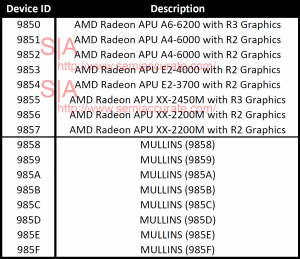 Finally, as you, the readers have noticed on the “Mullins” table, the branding seemed a bit different than what we current saw, such as “AMD A6-5200 APU with Radeon HD 8400 Graphics”, instead “AMD Radeon APU A6-6200 with R3 Graphics” was used. From here, we took the liberty to add a few data points. The driver INF files also have a couple of entries for the new “AMD Radeon R5 M200 series”. See the pattern there? It’s actually a new model numbering scheme in the works, or to be revealed soon. The Radeon branding remained, obviously for the brand halo, we don’t know if AMD intends to make their future APUs under the Radeon brand, or there will be tweaks to the final naming scheme, such that it becomes more of a resemblance of today’s naming scheme. The R5 and R2 denotes a series positioning, similar to the A10/A8/A6/A4/A2 and E2/E1 notations for APUs [Author’s note: It also works in similar fashion with Intel’s iSomethingMeaningless notation too], so there could be more in the pipeline as the new branding has to take care of high-end discrete GPUs above the R5 series. The M200 model number is a bit of head-scratcher here, it’s not decipherable by humans without a product positioning chart around. One could assume the M being Mobile segment products and another letter or two for desktop graphics, in contrast with FirePro W series for workstation, S series being Servers (VDI and GPU compute), while A series being APUs. So the number 200, again, defines the relative product positioning, this time among the same series, i.e. among the same M200 series products, so say for instance, there could be an M220 and an M240, and the next generation of products of the R5 family can be M320 and M335. Also, it looks the graphics differentiator string (“With R3 Graphics”) for the APUs can be simplified with the model numbers (for instance M200) omitted, to simplify things being printed on product brochures by a bit. Leo Yim is our correspondent from the far flung reaches of East Asia. Fluent in Mandarin, Cantonese and English he'd rather be talking about computers no matter what language. A true detail man he dreams of building gaming rigs from workstation class parts.